Powerful, uplifting music and lyrics bringing messages of faith, love and hope for everyone. Soulful vocals with guitar, piano, and horn lines that will make you get up out of your chair and dance with joy! Guaranteed to brighten your day. All of the musicians on this album are stars individually and together. Everyone has recorded their own projects and been on a myriad of other musicians' albums and together they created a gospel masterpiece. A lot of time and hard work went into this album, by the composer (who is also the lead vocalist and keyboard player) and all the incredibly talented musicians who played on this project. Most of the songs were written in the last two years and the last six months was spent recording, refining and making it shine. The lyrics were inspired by experiences, not only personal, but on a wider world level of the many things that are happening to our planet and humanity. 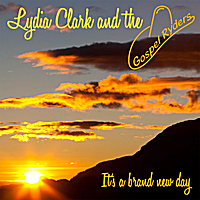 Lydia Clark, the composer, felt that through her music she could bring the messages that are most important and inspirational to her, that we are one world and must take care of each other, if we are to not only survive but truly live in peace and love. Too often that part of us strays to the outer reaches of our minds and lives and we despair and fall. In the song "The Truth Will Set You Free" the message is that "if you fall, I'll be there" resonates throughout this album and we hope that by listening to this music, it will inspire you to be greater in your life with every step you take and every act you create.